Hi there! 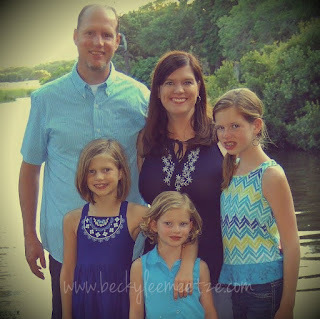 I'm Becky and here's a photo of my little tribe...the precious four I do life with everyday. We are 'The Meetze Family'. For those of you who don't know us "in real life"...that last name is a tricky one. It's actually pronounced 'mets' (like the baseball team) and if I ever have the honor of meeting you "in real life", there's no way I'll expect you to remember that, so you're off the hook! In many respects, I am the typical mom and we are an ordinary family, probably much like yours. You know, we fight - we make up, we succeed - we fail, we say too much - we don't say enough, we're clean - we're messy, we're on time - we're late, we're spending quality time together - we're running in 5 different directions. Are you getting it? It's just real, raw life around our house, day in and day out. Although life around here might be typical, I can assure you, it's never boring! God seems to like to show up and show out in our lives. We are happy to let Him. All that we are and everything we have, has come by the hands of our gracious, extraordinary God. This journey with Him is the greatest adventure! I hope you'll stick around here to laugh, think, learn, and grow! I promise to share as God leads and pray that it blesses you in some way each time you stop in to visit. I would love to visit with you through email. A little more about me: I'm a homeschooling mom who gets to stay at home by the grace of God and network marketing. I am happily married to an amazing man, who just happens to be a pastor. We met on a blind date 16 years ago. Speaking has become a passion of mine, and no one is more surprised by that than me! My favorite things: Time with God, seeing lives changed for His glory, writing, reading, flavored coffee, long talks, going to the gym, laughing, being with family, people who make me think/challenge me, nature, and capturing special moments on my camera (translation: I take a gazillion pictures trying to get the perfect shot and when I do I feel like I've just won the lottery). My Pinterest Board will "show" you more about me. I'm also on Facebook and Twitter...come follow me! This walk of faith is a journey, not a destination.